Said to be the wettest Kentucky Derby in history, the race got underway in a steady downpour with twenty colts making up the field widely hailed as the deepest in recent years. Justify was the 5/2 favorite at post time, headlining a talented array of colts with winning resumes. Justify broke well and was hustled by Mike Smith to the front of the pack alongside early leader Promises Fulfilled. The field was packed close through the first turn, setting blazing fractions despite the sloppy surface. 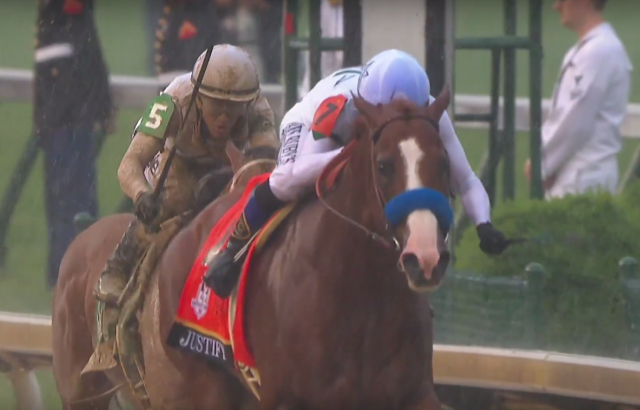 Justify took over the lead in the turn for home as Promises Fulfilled folded. Bolt d’Oro made a bid but simply couldn’t keep up; Good Magic made his run into the stretch and for a moment looked seriously as though he might be able to threaten the leader who continued to cruise, but simply couldn’t reel him in. Justify thundered home, the field in disarray behind him. Good Magic just edged out Audible, who shook clear of the field for a late bid at the leaders. The highly-touted Mendelssohn, Europe’s first serious Derby contender, was struck with bad luck early on when he was slammed hard twice out of the gate between horses and was eventually eased to the wire. As of press time, all runners appeared to come out of the race safe and sound, albeit rather muddy and damp other than the spotless Justify. Justify is owned by China Horse Club, Head of Plains Partners, Starlight Racing and WinStar Farm; he is trained by Bob Baffert who now has five Kentucky Derby wins under his belt. It’s hard to truly grasp the scope of Justify’s ability: undefeated though he is, he only had three starts prior to the Kentucky Derby. His class and raw talent are clearly just beginning to reveal themselves as he pushed blistering fractions over a sloppy surface, besting what’s being described as the deepest Kentucky Derby field in recent years. Justify truly demonstrated he was a class apart today, and Baffert is already comparing him to 2015 Triple Crown winner American Pharoah. Of course, there are still two jewels of the Triple Crown left to run, and with horses, anything can happen. We’ll wait eagerly to see what Justify can show us next.